The conferences were funded by the Spencer Foundation. For the report of the second part in Paris, France, please click here. The INLEPS 2017 conference had two parts--the first part in Madison, Wisconsin (U.S.A.) March 15-17, 2017 and the second part in Paris, France May 22-24; with funding by the Spencer Foundation. at the University of Wisconsin in Madison, Wisconsin (U.S.); and the second part at the Sorbonne University in Paris, France. Researchers gathered from international locations at both places and shared discussions in a roundtable format so people faced each other and the presenter interacted with the audience. The topic was displaced and refugee students in western schools, and how the teaching of language and context of the media and curriculum and teaching practices may affect their identity. The conferences were a success in terms of sharing research methods, learning of others’ work and experiences, and possible research questions. Many educators, at least one administrator, community members & activists, and interested people were present from the field of Education (Special Education, Second Language Acquisition, and others), and also people gathered in fields such as Latino Studies, French; from locations in the U.S. (Wisconsin, Kansas, Indiana), and countries such as Canada, France, Spain, Colombia, Turkey, Uzbekistan, Albania, China gathered. Policy analyses: national to local level; in addition to program evaluations. Interviews: teachers, students, families, school administrators, policymakers. A larger sample of one of these groups. For teachers: identify practices, attitude, background knowledge, experiences; students’ experiences; school administrators’ perceptions; policymakers concerns. Policies: studying the changes in national integration policies vis a vis the number of displaced people; investigating the effect of economic policies on people’s language choices to consider if they really have a choice; comparing the U.S. to Canada and European countries; looking at policies in places like China that have large migrant populations. A book is in press, with chapters related to the same theme. The reference for the book is Harrison, Sadiku, & Tochon, (2018). 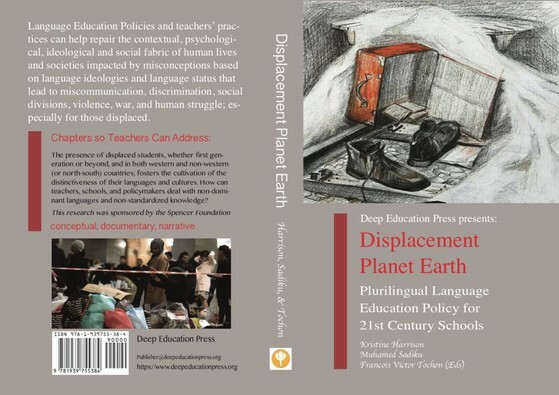 Displacement Planet Earth: Plurilingual Education and Identity for 21st Century Schools. Blue Mounds, WI: Deep University Press. One of the successes of the conferences is a refereed and edited volume in the LEP series.